Student debt is not really an issue in Scotland. This common belief is based on the country’s well-known policy of free tuition. It is pretty much true, for Scots whose families can cover their living costs in cash or kind. The picture is different, however, for those whose starting point is less privileged. Indeed, Scotland is an instructive case for what happens when fees become the whole focus of political debate about student debt and “ability to pay”. For some time Scotland has relied heavily on student loans to provide students in full-time higher education with support for their living costs. This year the balance is shifting much further. Cuts to student grants mean losses of nearly a thousand pounds, or more, for many students from the lowest incomes. Scotland now has by a long distance the least generous grant regime in the UK. However, the Scottish Government is making more loan available this year to increase the total value of support for living costs, where a substantial gap had opened up between Scotland, and England and Wales. As a result, all low-income young students will now need to borrow £5,500 a year (previously £3,400 to £4,200), and low-income mature students £6,500 (previously £4,400 to £5,400) due to the lower grant, if they want the full package of government support for living costs. As an honours degree in Scotland generally takes four years, many graduates who rely on the state for living cost support can now expect a government debt of up to £22,000 or £26,000, even without fees. Before these changes took effect, Scottish students were already borrowing around £250m a year in student loans. The Scottish Government has budgeted for this to rise this year by £167m (70%). By next year it expects to issue loans worth over £450m a year. This additional debt is headed mainly for those at lower incomes. Most student debt in Scotland was already being absorbed by those from poorer backgrounds (figure 1), with average debt particularly high for those deemed “exempt from contributions”, the group with no access to family resources. By contrast, in the absence of any pressure to borrow for fees, average debt was much lower for those students from better-off backgrounds who took out a loan, who often do not use their full allowance. 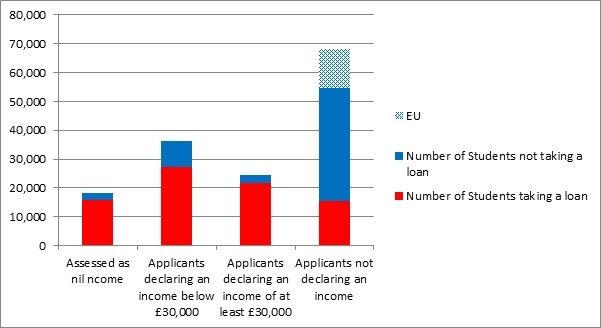 Further, large numbers from better-off homes did not engage with the loan scheme at all (figure 2). The minimum, non-means-tested loan is also increasing this year. However, as so many of Scotland’s better-off families already shun the existing scheme, it is hard to believe that this will radically alter the distribution of debt. With students from wealthier homes often still able to leave university with no or little debt, it has been easy to sustain a collective belief, not least among the better-off, that these arrangements are superior to ones elsewhere. Yet students from low-income backgrounds in Scotland now face levels of debt broadly in line with those for poorer students in the other devolved administrations, or in England between 2006 and 2011. Wales, with its high grants and relatively low fees, indeed offers the lowest debt for many low-income students, while also keeping debt levels for the better-off well below those in England. 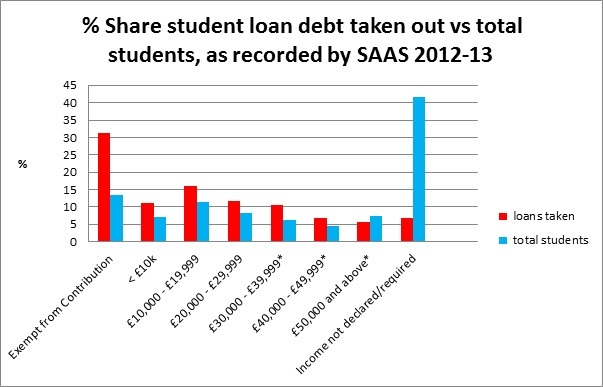 Figures from other parts of the UK show that where fees are charged and grants are used more, not only is the expected debt lowest for those at lower incomes, but also that loan take-up is higher in practice across the student population as a whole and actual debt therefore more evenly spread. In Scotland uniquely the system is now structured so that, the more your family has to start with, the less you will owe after you graduate. Under plans published last week by the Scottish Government for Scottish independence, free tuition remains the focus and there is no suggestion that existing debt will be reduced or of any return to a much larger investment in grants. The present arrangements therefore seem set to continue, even under a different constitutional settlement. The skewing of debt towards those who started at a financial disadvantage reflects a failure to give cash for grants the same political priority and protection as cash for tuition fee support, at a time when budgets are under pressure. Loans deemed unacceptable for fees have been embraced as an unproblematic substitute for state support for living costs. Yet a pound for one functions just like a pound for the other, once graduates begin to repay. Any student loan scheme boils down to a system of graduate contributions to the costs of the higher education system. Allowing that debt to be taken up predominately by those from more disadvantaged backgrounds will not improve social mobility. Is it possible to design a more progressive system which successfully persuades those from better-off homes to take on a larger share of the graduate debt burden, and leaves more cash available for grants? It is, but to do so would evidently be unpalatable to many in Scotland. So the country continues to demonstrate and even celebrate the alternative, a de facto system of graduate tax visited mainly on those who started from the poorest homes, while the post-graduation incomes of those from better-off families remain largely untouched, entrenching the current distribution of wealth. 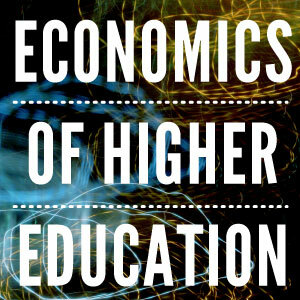 Note from editors: Loans are a key enabler of access to higher education, without which the liquditiy constraints from attending university would be too great for many potential students. Therefore, loans in and of themselves are not a bad policy. However, if you rely on loans as the main aspect of finance, those from poor backgrounds will inevitably end up with the greatest amount of debt. A fairer system would carry out means testing on non-repayble forms of support (such as grants), in conjunction with a universal loans system. Lucy Hunter Blackburn is a freelance policy analyst and former Head of Higher Education in the Scottish Executive (now Government). She blogs on public policy issues at http://adventuresinevidence.com/, where further background analysis to this piece has been posted.